As a writer, I sometime go fishing because I have a story to tell. The editor says, I need a story about fishing heavy weeds in midsummer.” So I head to a weed-filled lake with someone who knows how to pull those fish living in the salad below the surface. 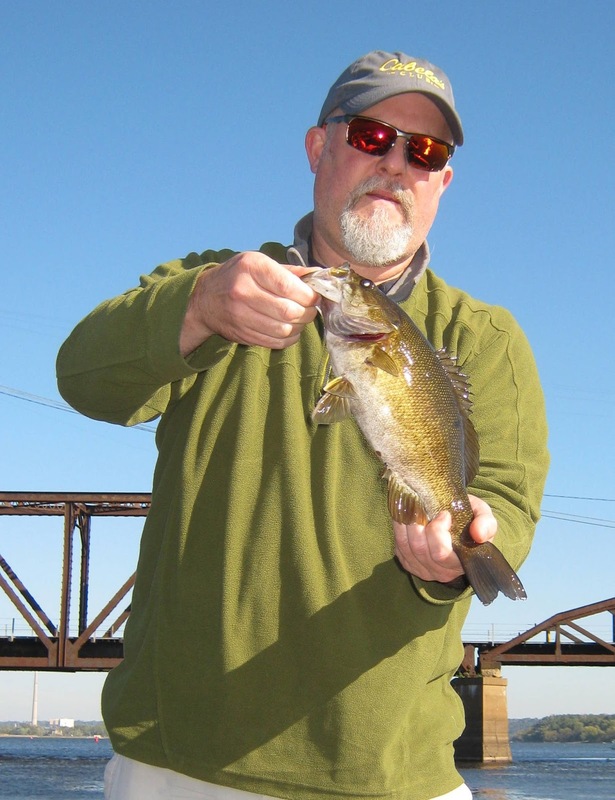 Brian started the story with a smallmouth bass. More fun is to go fishing and wait for the story to develop. What starts as a walleye fishing trip might evolve into a feature about tying knots or using a GPS to find and stay on the fish. That’s the sort of trip I took recently while attending an Outdoor Writer's conference in Minneapolis Northwest: specifically in Brooklyn Center, MN. Our fishing was done on the St. Croix River just east of Minneapolis where it forms the border between Minnesota and Wisconsin. The St. Croix is a major tributary of the Mississippi River that divides Miineapolis from St. Paul. I had no story, but I was waiting for a story. Bro Brosdahl is a walleye fishing guide, walleye tournament fisherman, an ice fishing angler so renown that Frabill, leader in the ice fishing gear industry hires him as a consultant. Bro grew up on the St. Croix River. What would happen when he returned to the St. Croix after a decades long hiatus? What would happen if Bro and I were sharing the morning with Brian Smith, a publisher, videographer, world traveler and good friend? Brian brought his daughter, Mya along. Would that be a story? I didn’t know, but I knew the fishing trip would be interesting, fun, probably productive, undoubtedly I’d find a story or two sometime that morning. I was right. The St. Croix, so close to Minneapolis is hardly a wilderness setting. It’s a playground for outdoor enthusiasts from Wisconsin and the Twin Cities. There were kayaks, there were mega-yachts. There were plenty of fishing boats and with the nice weather day we had despite it being late September, factor in water-sports enthusiasts. But that’s not the story, that’s the back drop. basis. We’d slowly drift with the current, bouncing a jig and minnow along the rocky bottom. Brian scored first, but it wasn’t a walleye; rather a smallmouth bass. Mya hooked up next and hauled in beautiful yellow perch. A dozen of those would make a great fish fry. Bro did catch a walleye, but it wasn’t fast action and not much of a story. So we moved downstream to an area with a naturally rocky bottom. 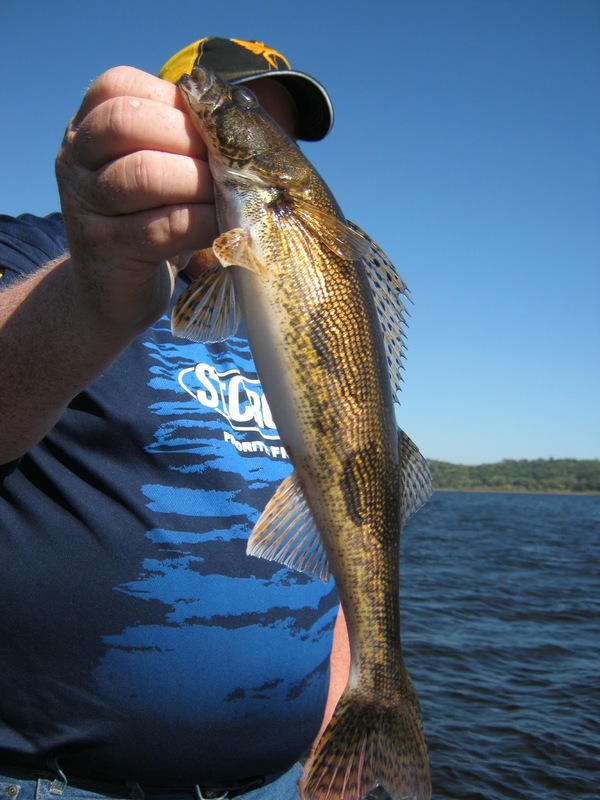 The next fish to come aboard was a sauger, close cousin to a walleye, equally tasty. Then Brian, casting up to shallower water felt a strike and his fish stayed deep and only reluctantly allowed itself to be pulled to the surface. A three pound channel catfish was at the end of the line. “I believe I’m beginning to see a story line here,” I thought. We’ve caught four species of fish already. Then Mya’s rod doubled down and species number five was in the boat. She’d hooked and landed a short-nose gar. That, in itself is story-worthy, but that’s another tale. 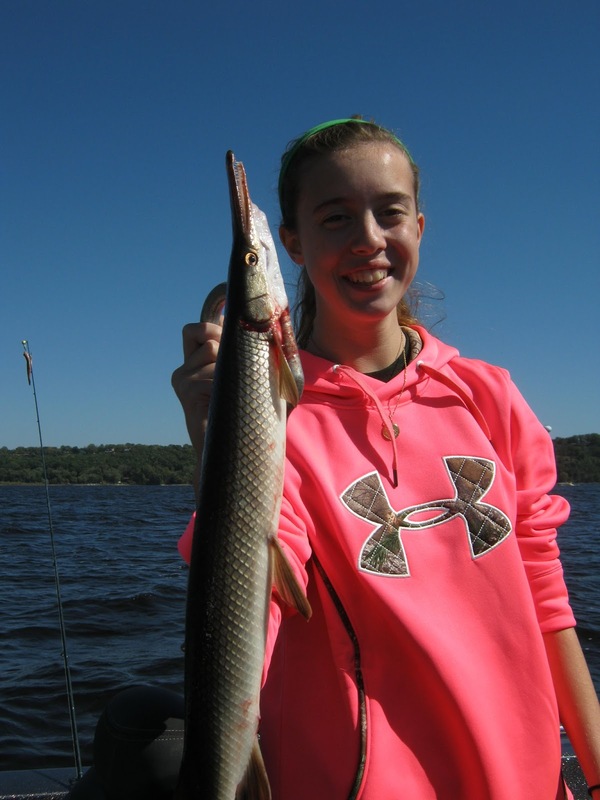 Gar are plentiful and fierce predators, but not often caught with hook and line. I’ve never caught one or seen one caught. Bro, switched to a jigging spoon and soon hauled a good sized white bass to the surface. “Is there any species of fish in here we haven’t caught?” I asked. The fish swished to the surface and I quickly slid the net under it, still unsure of what it was. In the net, the ID was easy. It was a bigmouth buffalo. I’ve seen plenty of buffalo, have successfully bow fished for them, but again, I’ve never caught one or seen one caught. So that’s my story on the St. Croix River. A place with many kinds of fish to catch, and most of them willing to bite!